I've always loved language. Back around 5th grade, a friend bought me William Safire's first book in the On Language series. I found it fascinating then, and I still love his columns now. The main difference between Safire and myself is that he actually knows about language, whereas I'm just an amateur. But I think through this blog I can share some interesting things I've found, and hopefully learn a lot along the way. I started learning about Judaism as a teenager, and so many concepts that others take for granted were somewhat new to me. I also moved to Israel from the States, and so had to learn not only the language, but the slang, abbreviations, technical terms and more. Judaism and Hebrew will be the main focus of what I'm writing about. 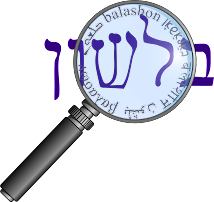 The title of the blog - Balashon - is a combination of the Hebrew word for detective, balash, and language, lashon. I have quite a few resources available to draw from, but I will really appreciate any ideas for things to research. And of course, I welcome criticism, suggestions, etc. Looking forward to exploring the Hebrew language with you!